EFT Sports Performance has become a renowned training facility in part because of the famous athletes that have trained there. The jerseys of Matt Forte, Devin Hester and Rashaan Melvin hang on the walls among many others, but EFT has developed into much more than just a gym for the big names. Through the Beyond Sports Foundation, EFT continually helps under-resourced families provide tutoring and physical training to high school student-athletes in the hopes of them earning life-changing college scholarships. This edition of Medill Newsmakers gives you an inside look at the EFT and the Beyond Sports Foundation. COMPTON, Calif. — DeMar DeRozan, like countless other children across the world, dreamed of one day playing in the NBA and becoming an All-Star while watching Kobe Bryant star for the Los Angeles Lakers. For DeRozan, that dream began in Compton, California, and he has since developed into one of the best basketball players in the world, earning the titles of McDonald’s All-American, Olympic gold medalist and NBA All-Star. The Toronto Raptors’ guard will be making his fourth All-Star Game appearance on Sunday night, and he will be living out his childhood dreams at the Staples Center. 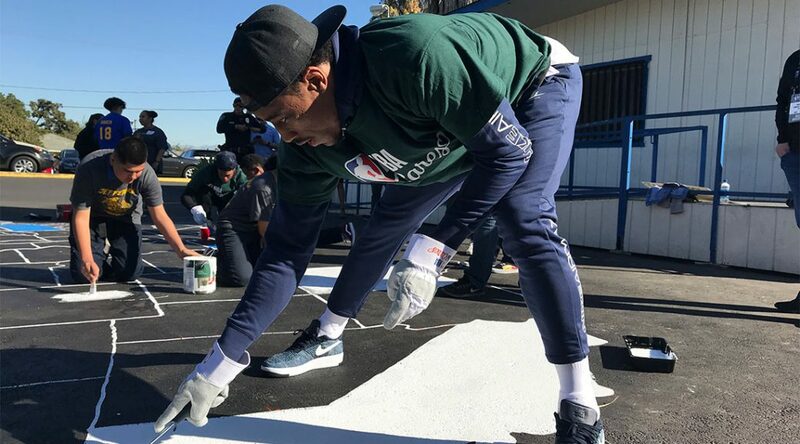 But before all the praise that will be thrust his way over the weekend, DeRozan spent Friday morning with fellow Raptors’ teammate Kyle Lowry, giving back to the community that raised him.